First of all, there is a great misconception concerning the naming of the peafowl species. Although most people call both male and female peacocks, the proper term for them is peafowl. Only the male is actually a peacock, the female is a peahen, and the young are peachicks. However, even I usually just refer to them all as peacocks. Peafowl belong to the same family of birds as pheasants and chickens, which is phasianidae. There are three natural types of peafowl that appear in the wild. They are the Indian Peacock, the Green Peacock, and the Congo Peacock. 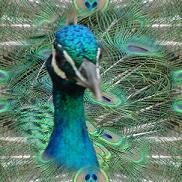 For more on these three types of peafowl and their many varieties produced through selective breeding, check out my Peafowl Varieties Database. The peacock and the peahen vary greatly. When the species is thought of, the male always comes to mind. The males have long feathers which they spread, or fan out to attract the females. These feathers are not actually part of the tail, they have brown tail feathers which support this tail coverts. These feathers are beautifully colored. The color differs between different breeds and individuals, however the feathers are usually iridescent. Most of these feathers have circles of color near the top, and are often called "eye" feathers. In the center is usually a deep blue color, known as peacock blue. The body is also colored, depending on the species. Peahens are less brightly colored, and lack the tail coverts, although some Green hens develop tail spurs. They do, however, occasionally spread their real tail feathers. Both males and females have crests or "crowns" on their heads, although the males' are brighter. The offspring of the species, known as peachicks, usually resemble turkey poults in coloration, except in some variations. A male is fully mature at three years old. However, all peafowl may begin to mate at two years. Usually at least one mature bird is needed to produce fertile eggs. Breeding takes place during spring or early summer. Throughout this time the peacock spreads and vibrates his "tail" and makes a loud mating call. Although normally quiet, peafowl become quite loud during the mating season. In August, peacocks molt their tailfeathers and begin to regrow them. The peahen usually lays between 6 to 12 eggs, although this varies between birds. The eggs hatch after 28 days. In captivity, these eggs can be hatched naturally, artificially in an incubator, or under other birds such as chickens, turkeys, or ducks. Peachicks are born fully feathered and can fly within a week or two. Since peacocks roost in trees if possible, they must learn this to survive and stay with their mother. They must be taught to eat, which the peahen teaches them through a variety of sounds. Peachicks need warm temperatures to survive and many are killed by cold climates. Indian Peafowl have become common in most parts of the world because of domestication. They are found in the wild in India, where it is the national bird, and the surrounding areas. The Congo peacock is found in Africa. Wild and free roaming peafowl have an omnivorous diet of worms, insects, small snakes, mice, seeds, berries, snails, frogs, grain, juicy grasses and bulbs. They need significant amounts of protein to be healthy and reproduce well. There are probably many thousands of peafowl in the US, however they can not exactly be called common. Their loud screams during mating season helps to discourage this. However, if the market for exotic animals grows as it is currently doing, peafowl may soon be in much greater demand and their prices may rise. The peacock is a very interesting bird that is found in history, mythology, art, and modern culture. It is well loved by many and will hopefully continue to be so in the future.